I’ve been using this rule for years, and it has made my email life so much easier. Everyone I’ve shown this to has given me the feedback that this is a great idea, so I thought I should also share this with my readers here on the blog. The rule filters away everything from your inbox that you normally won’t need to read anyway, thus significantly reducing the amount of email you read every day. Especially when you’re coming back from a vacation, this filter is really helping you get up to speed. The rule leaves everything sent directly to you, and everything marked as important, in you inbox (and moves everything else away from there). First, you need to create a separate folder to which most of your email will be moved, I like to call mine “@CC”, but you may call whatever you like. 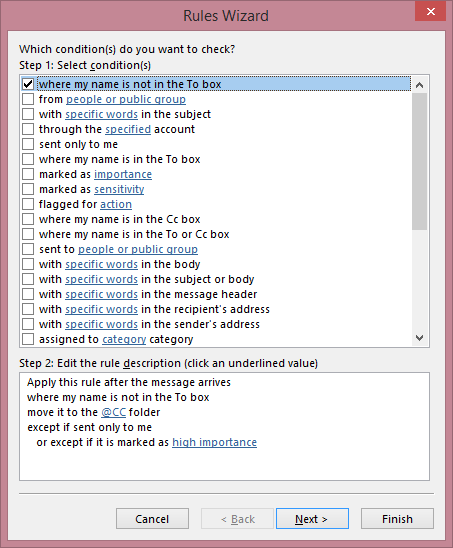 Then, go to rules, and set up your email rule as I have done (see the picture below). Enjoy!